Many companies need to “Countersign” their proposals once the client has signed and accepted so that the proposal is considered full "executed" or completed. 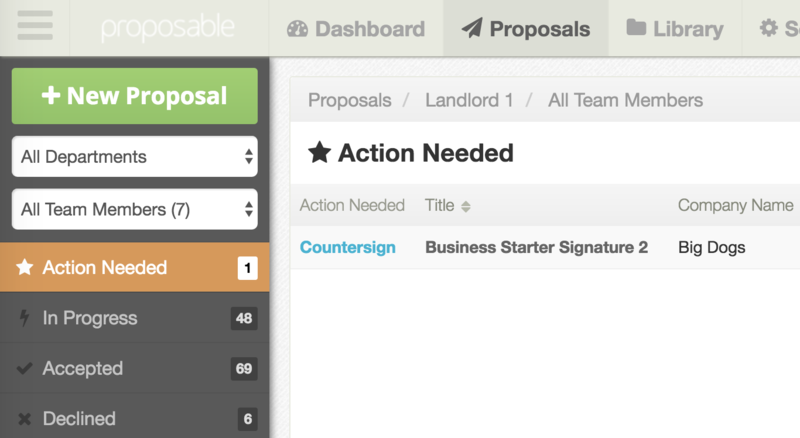 You can easily set up your proposal signature page with countersigning fields. Once your prospect signs and accepts your proposal, you will be prompted to take the countersigning actions to "Complete" the proposal or sales document. Simply drag signature fields out on top of your proposal content wherever you need to countersign and adjust the signature field to be “assigned to sender” (See video below). Before Delivering, you will see all the steps that are required to complete the Proposal based on the signature fields you have placed. Once your recipient has accepted and signed the proposal you, the sender, will then be notified and asked to take action to countersign the proposal to make the proposal acceptance “Complete”.